LITTLE ROCK, Ark. 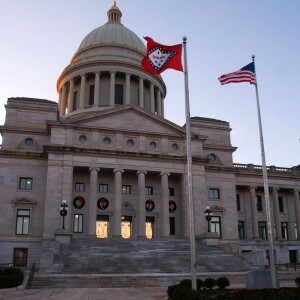 — A prominent atheist activist organization is seeking to place a “no gods” display on the grounds of the Arkansas state capitol following the approval of a Ten Commandments monument proposed to be erected at the location. As previously reported, Sen. Jason Rapert, R-Bigelow, had proposed the monument, which will be overseen by the Secretary of State and funded by private money. Rapert’s bill was approved in the House and Senate in March and April, and was subsequently signed by Gov. Asa Hutchinson. “The placement of the monument under this section shall not be construed to mean that the State of Arkansas favors any particular religion or denomination over others,” SB 939 read in part. However, The Universal Society of Hinduism soon submitted a proposal asking that the state also allow the placement of a statue honoring the Hindu monkey God Hanuman on the grounds. “Besides honoring the Arkansas Hindus, this statue would raise awareness of Arkansans about Hinduism, the oldest and third-largest religion of the world with about one billion adherents and a rich philosophical thought,” leader Rajan Zed told reporters. Last week, the office of Arkansas Secretary of State Mark Martin told the Society that it must go through the General Assembly to approve the monument or submit an application to the Arkansas State Capitol Arts and Grounds Commission. The group People for the Ethical Treatment of Animals (PETA) also submitted a request to hang a banner across the capitol that read “Give Peas a Chance,” but the Secretary of State’s office said that it would have taken up too much space and thereby violated the display policy. Now, the Wisconsin-based Freedom from Religion Foundation (FFRF) has submitted a letter to both Gov. Hutchinson and Secretary of State Martin in its quest to erect a monument representing atheism. FFRF asserted in its correspondence that erecting the Ten Commandments monument on the capitol grounds would turn unbelievers into “outsiders” in the state. It also expressed its opposition to the decalogue’s demands. As of press time, a response has not yet been provided by the state.